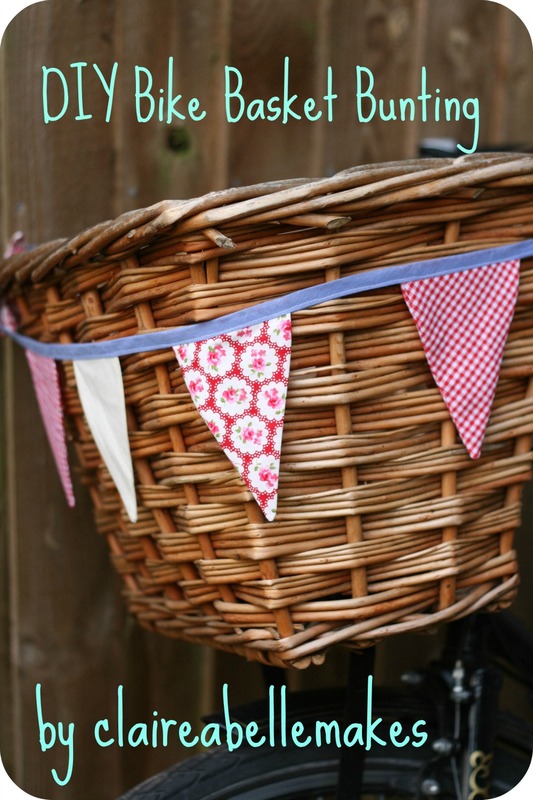 I am SUPER excited about this tutorial for DIY Bike Basket Bunting. A lovely Twitter friend pointed out this week, that most of my likes revolve around the letter B. Bicycles, Biscuits, Baking, Buttons…….this blog post continues that theme I suppose! Begin by measuring the outer sides of your bicycle basket to determine the length of your bunting and how many flags you would like. 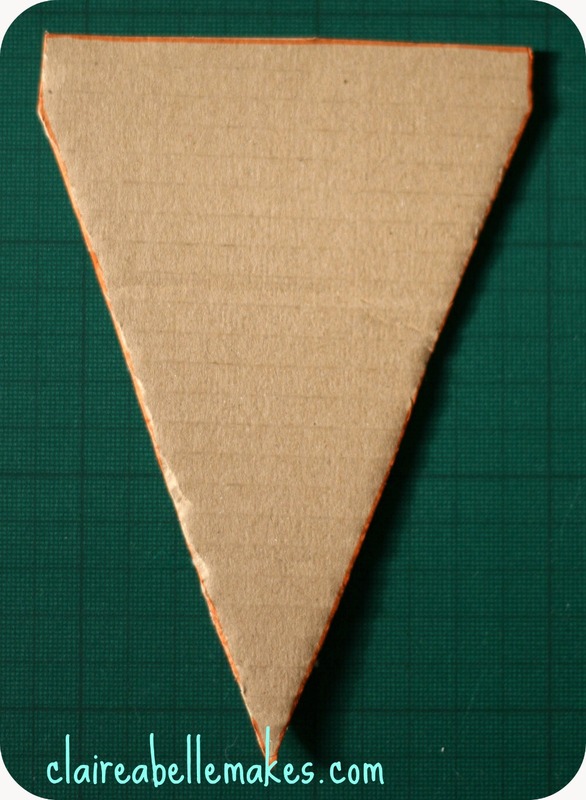 I started with a bunting flag template cut out of cardboard. I’ve been meaning to buy some perspex templates, but I haven’t got around to it yet. 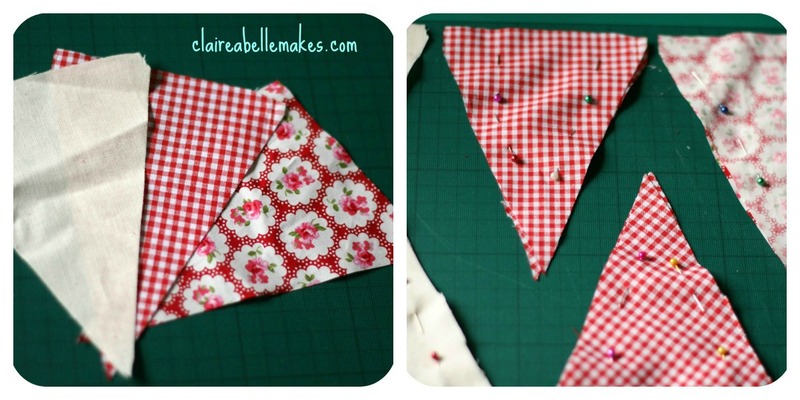 The template is smaller than ‘standard’ bunting, but you can choose the size depending on your basket size. 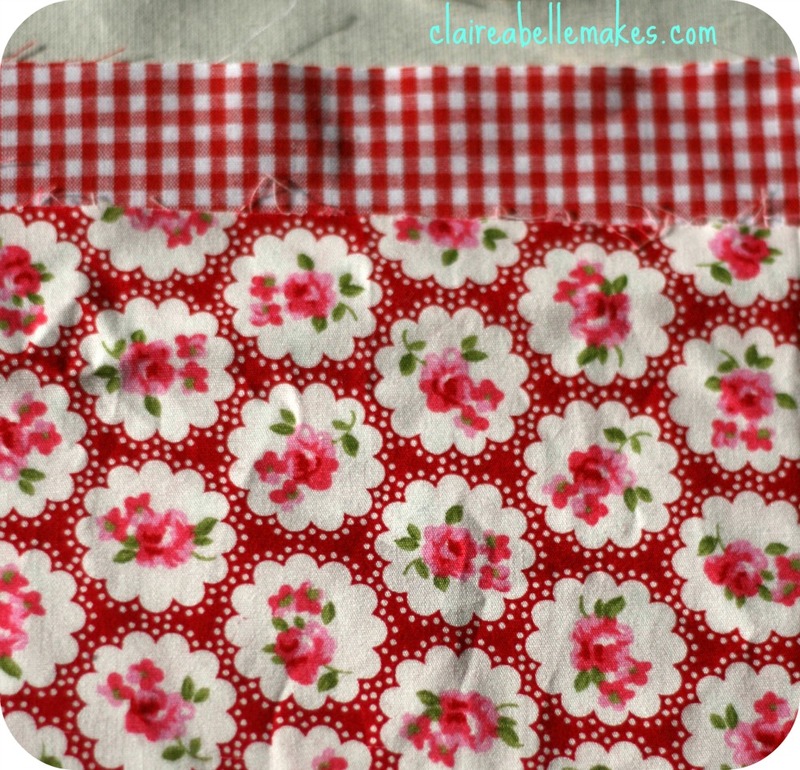 The fabrics I chose for my bunting were from the wonderful online fabric store Sew La La. It is run by the equally wonderful Kath, who offers impeccable service for every order, no matter how big or small. Make sure to check the shop out and say hi to Kath! I stacked the fabrics on top of one another to make cutting out much quicker. Using a rotary cutter, mat, steel ruler and template, I cut out 4 triangles of each fabric. This tutorial from the Purl Bee on using a rotary cutter may be useful if you haven’t used one before. 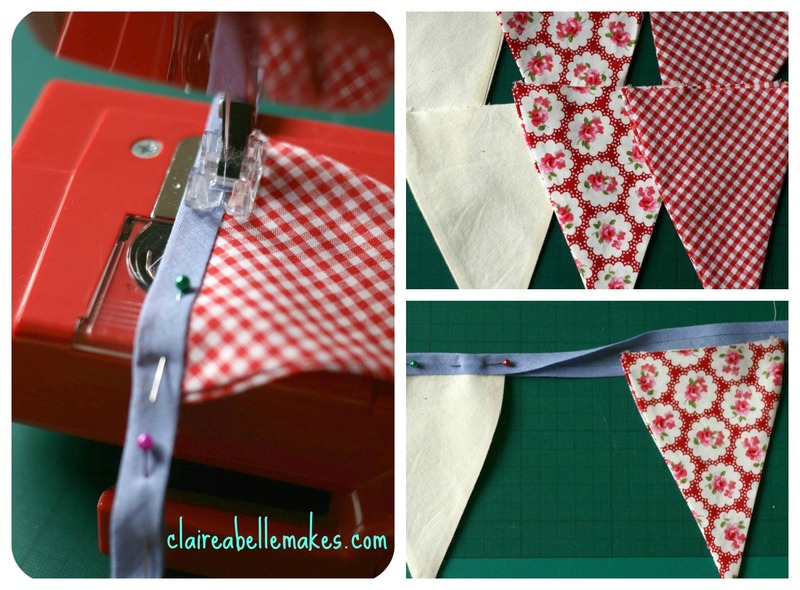 However, you can also use a pair of fabric scissors to cut out the bunting flags. Match the triangles together to make two flags in each pattern. Pin the flags together with right sides facing. Stitch along the diagonal edges of each flag with a 1cm seam allowance. Trim back the point of each flag to allow a clean triangle when turning out. 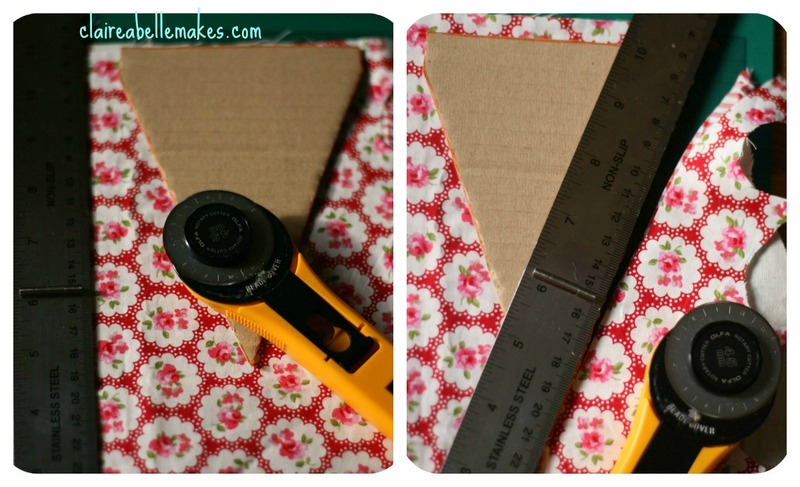 TIP: I used my small scissors to push the end of the triangle out. Once all flags are turned out, press them with a steam iron. Using bias tape of your choice, arrange the flags at equal distance, fold the tape over and pin into place. Then stitch along the top of the bias tape to secure the flags in place. You are now ready to attach the bunting to your bicycle basket. I used clear nylon thread to stitch through the bias tape and in to the gaps of the wicker. This helped to hold the bunting in place to prevent it from slipping down the basket. Stand back and admire! Now I’m hoping the British summer rain holds off so my bunting can remain in tact! What do you think? You can also find this post at Shabby Art Boutique and Pin Cushion Creations! Love your bike bunting, so pretty. 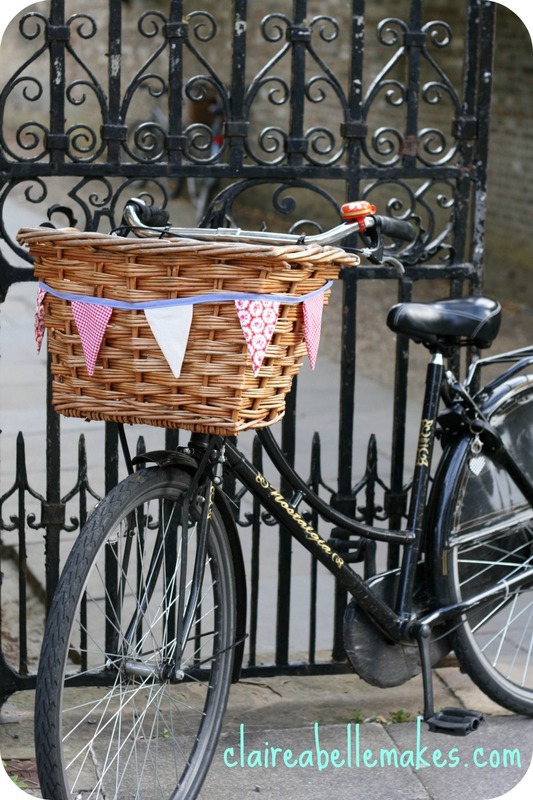 I have crochet bunting on my basket…………..oops no I did have crochet bunting on it until some hideous thief stole my bike. Got the bike back hooray but not the bunting so currently it’s decorated with lovely crochet flowers! Might have a go at your pattern though looks really good! Oh sorry to hear your bike was stolen 🙁 horrid isn’t it! But glad you got it back and have some crochet flowers on it. Sounds pretty! Thanks! I think bunting really cheers anything up! That’s funny as you have inspired me to make crochet fireplace bunting! I too love this. I do think that you should not make your bike look too attractive however. Just thought that I should attach some to the car so we can find it when parked in huge fields!!! Gorgeous! I just bought a bike to it’ll be awesome on it! Really pretty, now you make me want a bike plus a basket plus bunting. Do you plan to keep it here over the winter, or maybe make a christmassy one instead? I may take it off in the winter if the crazy weather starts to ruin it. That’s a very chic bike – and the bunting is so fitting! I like your bike it looks extra special now you have the bunting on to jazz it up! It has already survived flash flooding and hail in Cambridge yesterday!! Great idea, and I love your photographs. Lovely idea. Too many hills around here for proper bikes with baskets – bikes around here are all occupied by lycra clad people (think Lizzie Armitsted and her Olympic medal). Though some of them may look a bit better with bunting! Someone suggested fireplace bunting – might do some crochet hearts for mine. This bunting looks great and your photos are fab. My bike doesn’t get enough of a workout to justify this but might have to do it anyway. Great pics, thanks. It will make those rare bike rides more special, I’m sure! This is very sweet. I don’t see a lot of bikes in the US with baskets on them, but I really like them. 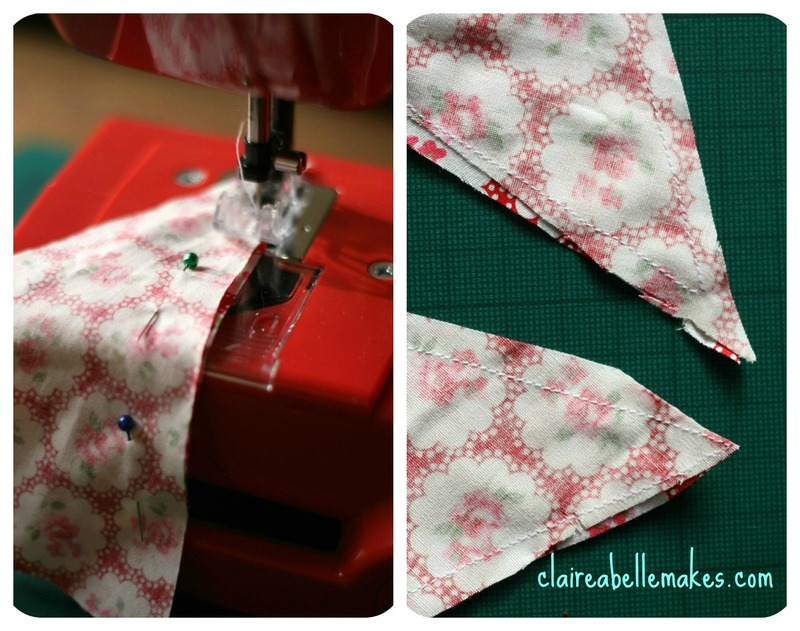 Another great sewing tute in the handmade monday gallery! love those little triangular cuties! Yes we are lucky in Cambridge, the city is made for bikes! Very clever…it makes your basket so cheery! I have bunting on my baby’s car seat! If it doesn’t move bunt it I say!!! This is sooooo adorable!! How fun to put it on a bike….I always see them in babies rooms! I would LOVE to have you share this at my party!! There’s something about bunting that flicks my ‘thrill’ switch. I can’t ignor the allure! Village fetes, sports day at school, the queens silver jubilie (1977) and a thousand Sunday events which were made brighter by bunting- have created an auto-response from the mere sight of a flicker of bunting…fills me with childlike excitement. Thanks bunting. I love seeing baskets with fake flowers – so pretty!